As a friend of Dorian Feller (aka Bruno Chapoutot, you're right), I actually helped fund the Rock Feller release, and I cut some of the sleeves to put the insert and stamped them. Part of the story is told on Blogonzeureux! (in French...). 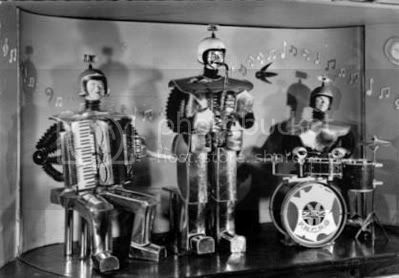 As for the robots picture, I don't know how you got to link it to Rock Feller (I d'ont remember Dorian using it in a booklet), but it is actually Les Robots-Music (more about their virtual record on Vivonzeureux!, in English here and more again with pictures and video but in French there). 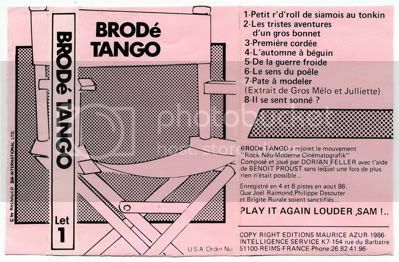 As for Brodé Tango, Bruno issued a CD-R best-of some time ago (reviewed on Blogonzeureux! in French). Also, Dorian is not connected to the internet, but he does have a Myspace page run by a friend.